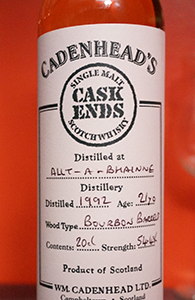 I’ve noted on more than one occasion that I know nothing about certain distilleries, and I know I shouldn’t make a virtue out of ignorance, but of all the distilleries whose malts I’ve sat down to review I know least about Allt-A-Bhainne. Not only do I not know where it is located or how the name is pronounced but I have to keep checking to make sure I’m spelling it correctly. Well, it turns out it’s in the Speyside and is owned by Chivas Bros./Pernod Ricard, isn’t very old (founded in 1975) and, improbably, its name is pronounced exactly as it’s spelled. It produces for Chivas Bros.’ blends and I’m not sure if an official malt is even available.